Succeeded by KEMBLE ca. 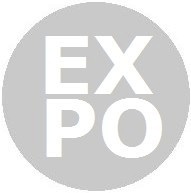 1960 and arrived to make a total of 60020 pianos that year. 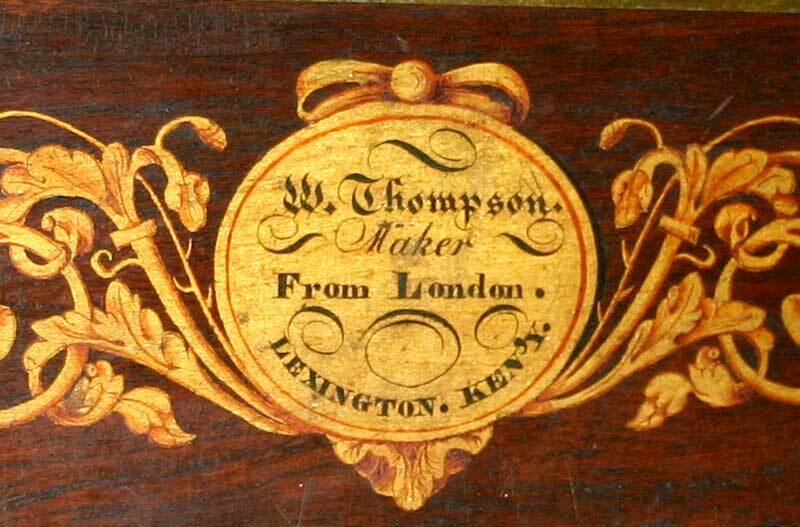 THE MUSICAL INSTRUMENTS & GENERAL TRAFING Co Ltd.
Square pianoforte ca. 1803-06, nameboard, more photos, Mary Todd Lincoln House, Lexington, Kentucky, U.S.
"PIANO-FORTES. - PIANOFORTES. 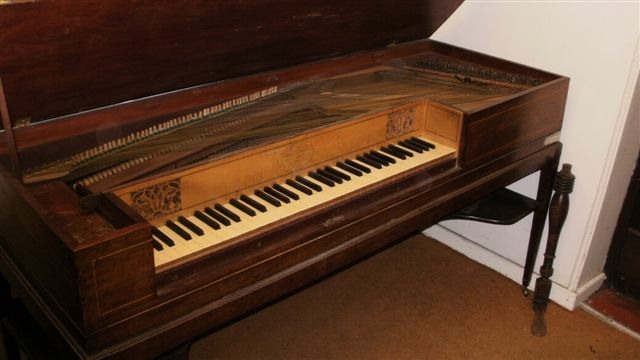 - Mr. TIERNEY has the honour to acquaint his connexion, the country gentry, and purchasers generally, that his services may be commanded to select pianofortes for them from approved stocks, and of such quality and character as to render the first purchase the most advantageous. 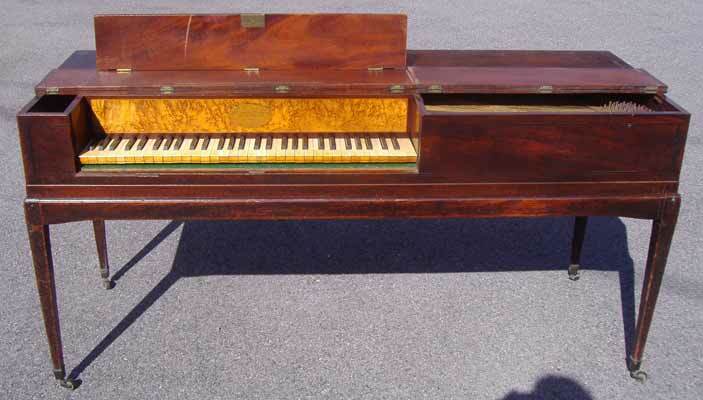 His competency for the task will be found in an intimate acquaintance, as a pianoforte tuner, with every variety manufactured during the last 17 years of progressive and important improvements, a practical knowledge of their construction in simple and complicated mechanism, and the various requisites necessary to the formation of a fine instrument. 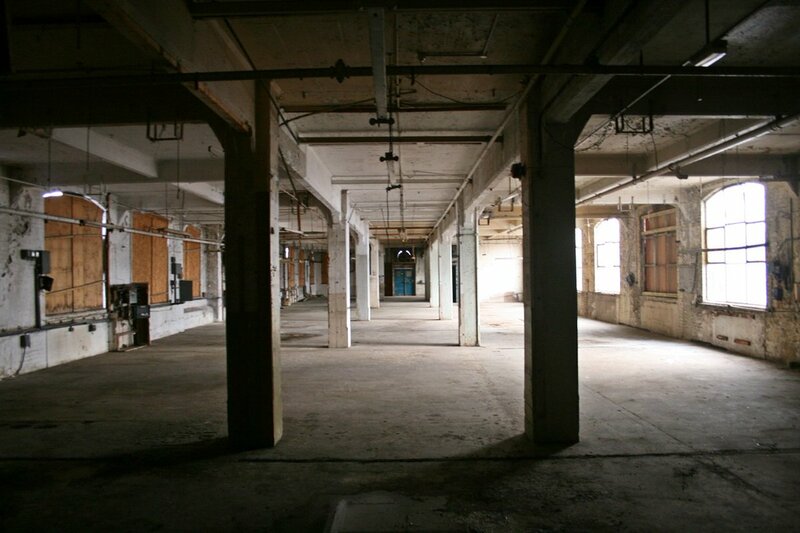 The selections made by Mr. Tierney are critically tested, and the utmost reliance may be placed in any choice of his.—Rolls-buildings Fetter-lane. 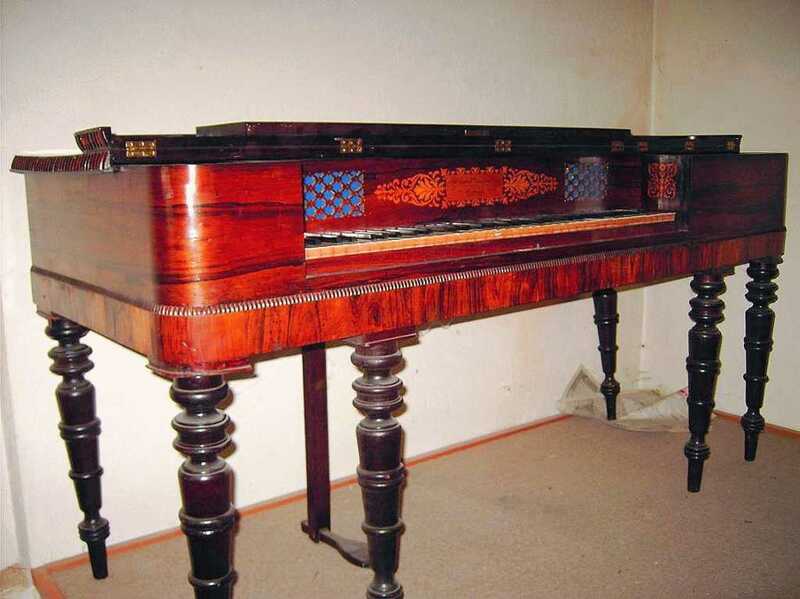 Square pianoforte n° 35 ca. 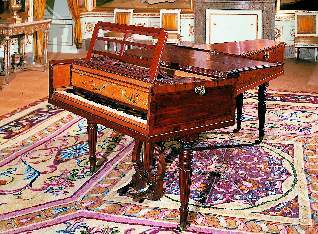 1795-1800, The Music Room Workshop, Prestwick Farm, Prestwick Lane, Chiddingfold, Surrey, England, U.K.
Square pianoforte n° 1732 ca. 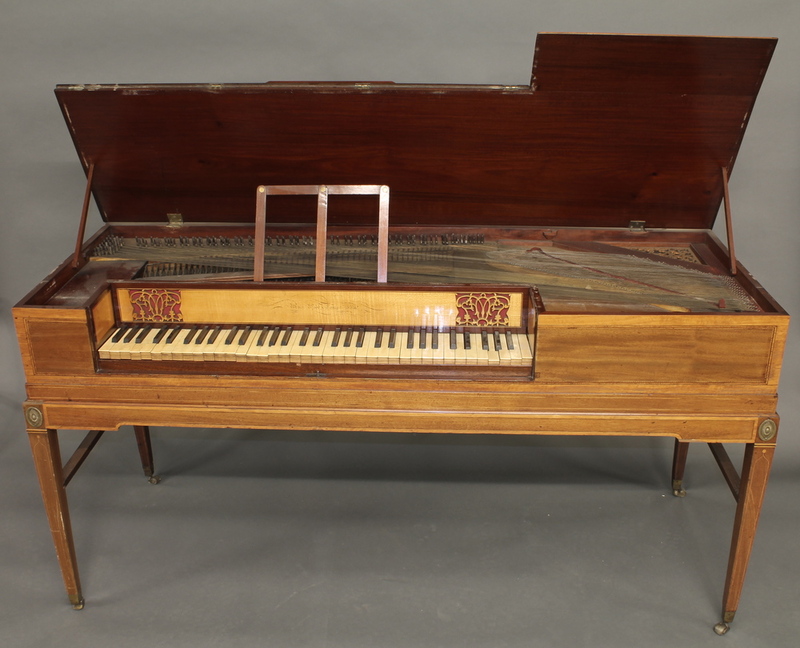 1805, The Monart Collection, Wexford, Ireland, U.K.
Square pianoforte n° 1965 of 1810-20, The National Museum of American History, Washington D.C., U.S.
Square pianoforte n° 4714, Jane Hope, Oxford, England, U.K.
Square pianoforte ca. 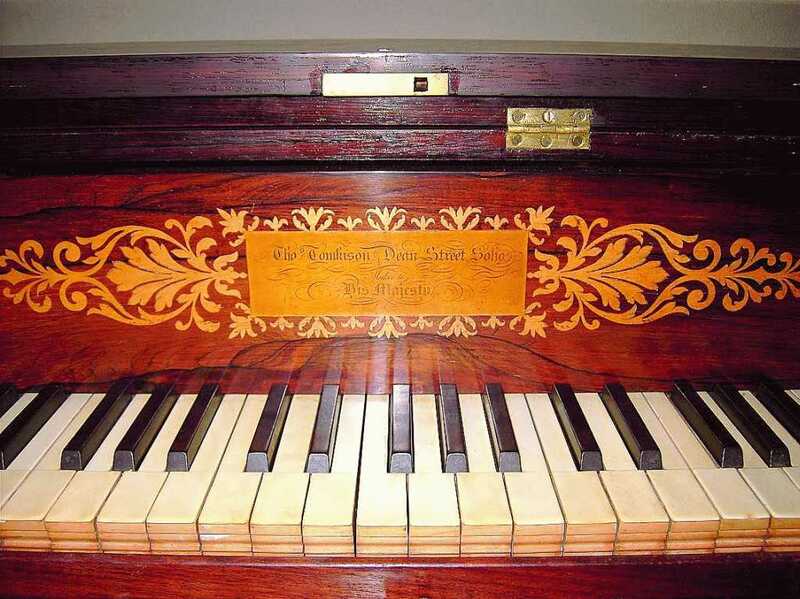 1823, Artis Wodehouse, New York, U.S.
1839 - "TOMKINSON's [sic] NEWLY-INVENTED PIANOFORTE. 1858 - TOMKISON on TURNER - "Anecdote respecting the great Artist, the late “W. M. Turner, RA. 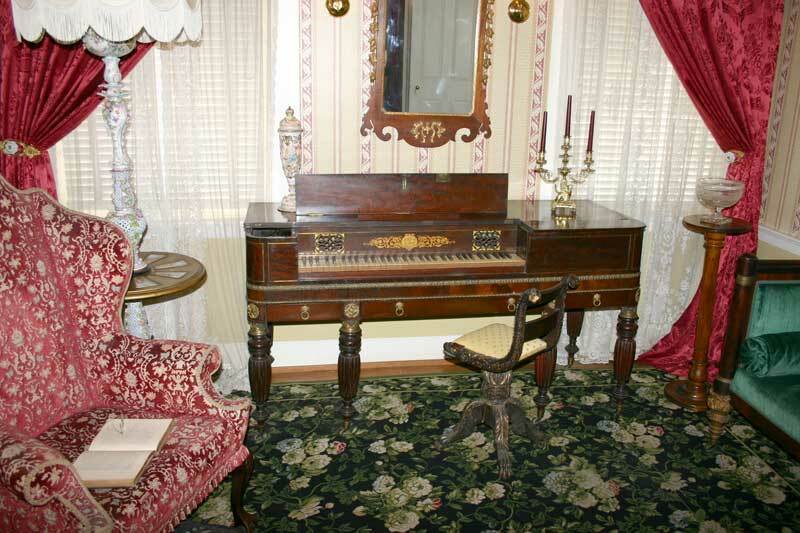 — Mr. Tomkison, the eminent pianoforte maker, called on me one morning in the year 1850. I had shown him a small picture by Constable. This led to remarks on the merits of landscape-painters; and Turner, of course, was alluded to in the way his great excellence deserved. Mr. Tomkison then observed: “My father was the first to discover the boy's talents. 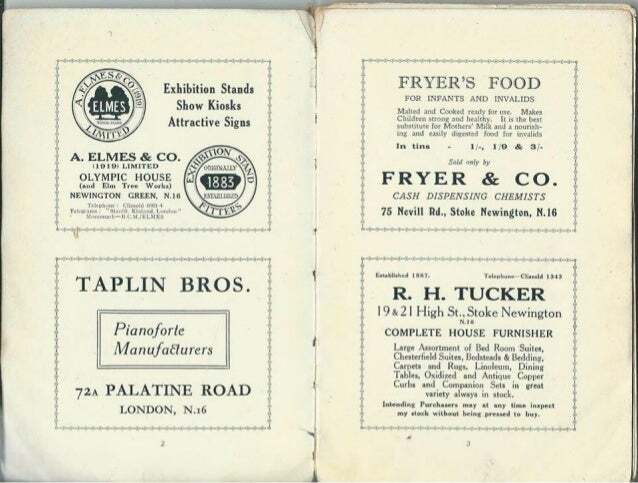 My father was a jeweller, and lived in Southampton Street, Covent Garden. Turner‘s father was a hair-dresser, and lived in Maiden Lane, a corner house in a little court; he operated on my father. On one occasion Turner brought his child with him; and while the father was dressing my father, the little boy was occupied in copying something he saw on the table. They left, and after a few minutes they returned. Turner apologised for troubling my father, and begged to know what his son had been copying. On being shown the copy, my father said, ‘your son never could have done it'. He had copied a coat of arms from a handsome set of castors, which happened at that time to be on the table. Some time after a gentleman died, who had been long under Turner's razor, and left him a legacy of 100%. The moment my father heard this, he begged Turner to allow him to dispose of the 100%. for the benefit of the boy by articling him to Malton, the distinguished architectural draftsman of that day— this was done accordingly." Patent of 1871 : "A.D. 1871, January 28.-No. 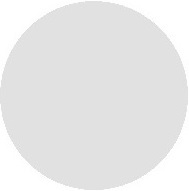 236. TONGUE, William, of Kennington, in the county of Surrey, engineer. 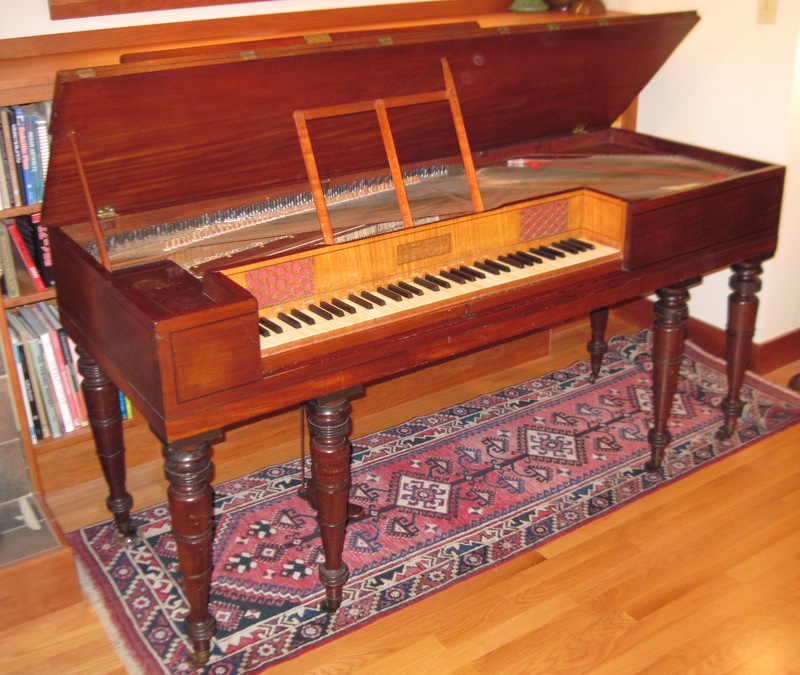 — Improvements in pianofortes, harmoniums, and other musical instruments. 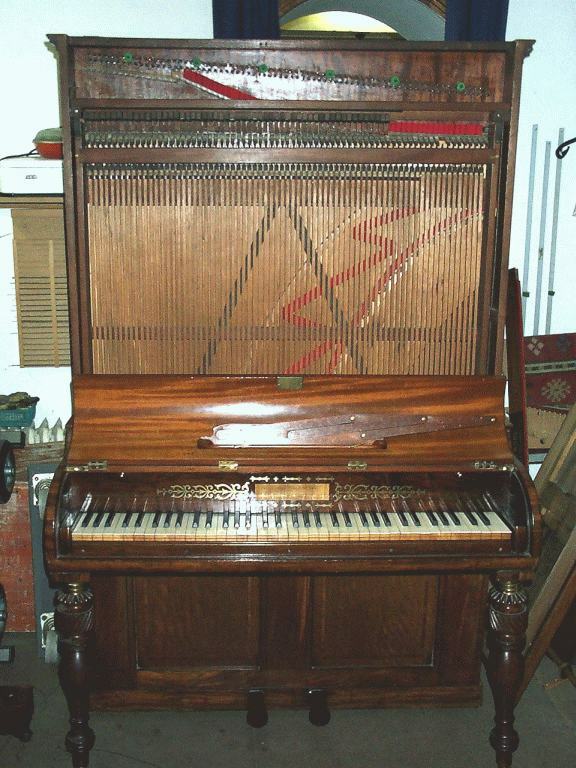 According to one part of this invention the metal wires or strings in pianofortes are formed flattened or broader at one part of their section than at the other part, such wires or strings being so arranged that the hammer will strike against the broad or flattened part of the wires or strings. According to another part of this invention one metal wire or string is employed in place of two or of three strings for each hammer, such wire or string being formed flat like metal tape or clock spring. According to another part of these improvements when employing flat metal wires or strings, such strings are caused to vibrate and produce musical notes by means of a current of air directed against such strings. A metal clasp or surface is attached to the flat wire or string for the air to impinge against. According to another part of this invention apparatus is combined with a pianoforte for producing and directing a current of air upon the flat metal strings or wires having a metal clasp or surface attached thereto, as above described, so that the vibrations of such strings produced by the blow of the hammer may be maintained by the current of air. Square pianoforte ca. 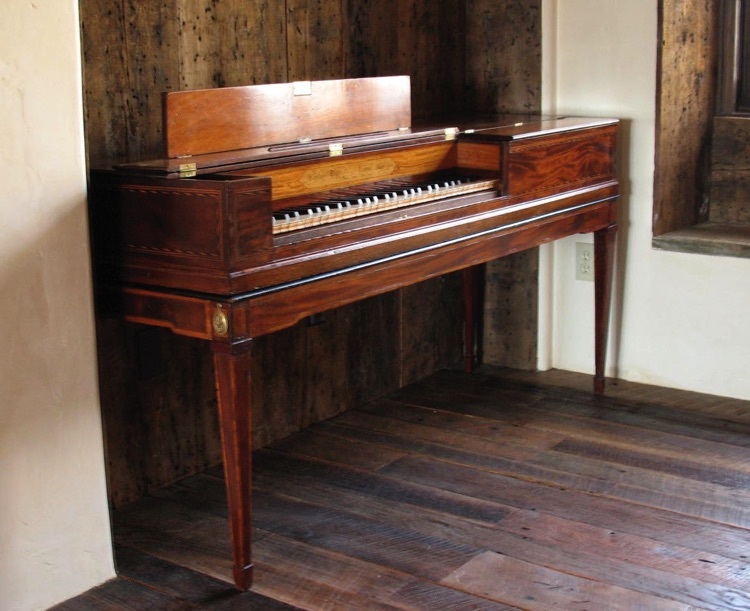 1781, The George Sherman Dickinson Music Library, Vassar College, Poughkeepsie, N.Y., U.S.
Square pianoforte ca. 1784, Thomas Winter, San Francisco, California, U.S.